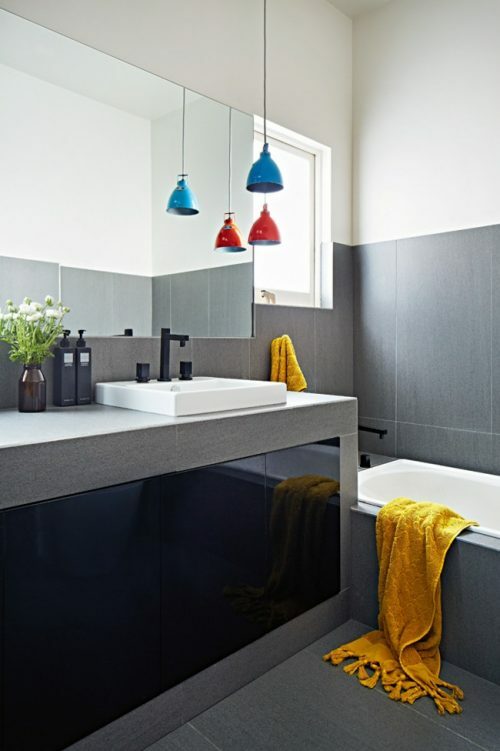 Kitchen and bathroom renovations are my favourite spaces to transform, and this year we are seeing so much variety in design trends, particularly coloured tapware and appliances. The industrial aesthetic has taken a sleek turn during the year with layered colour palettes and textures to create spaces that are fun and sophisticated. 2016 is all about adding your own signature style and what better way to do that, than with bold tapware and accessories. Black tapware has become a fast growing trend in Australia and around the globe, making it more readily available to consumers and at the forefront of interior design. Black adds a sense of minimal luxury that can work with both the old and modern interior styles to make a bold and sophisticated statement. This is definitely a trend that will be around for years to come. 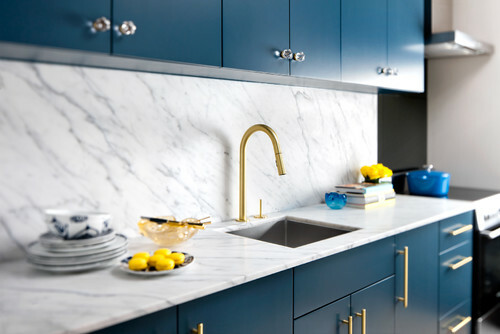 The magic of metallics used in kitchens and bathrooms this year is out of this world. Simple, elegant touches of bronze, brass, copper & gold take interior design to another level. The warmer metallic tones add a stylish statement to compliment subtle colour palettes such as smokey greys, dusty blues and pastel pinks in cabinetry and tiles. They also contrast beautifully with natural stone and marble benches, like the kitchen example above. Colourful tapware isn’t just limited to – literally – taps; you can apply this trend to any part of your bathroom, like these yellow taps, railing and shower head which cleverly brightens and complements the grey tones of the bathroom. When it comes to using pops of colour, red is a bold and popular choice, and it’s not hard to see why. 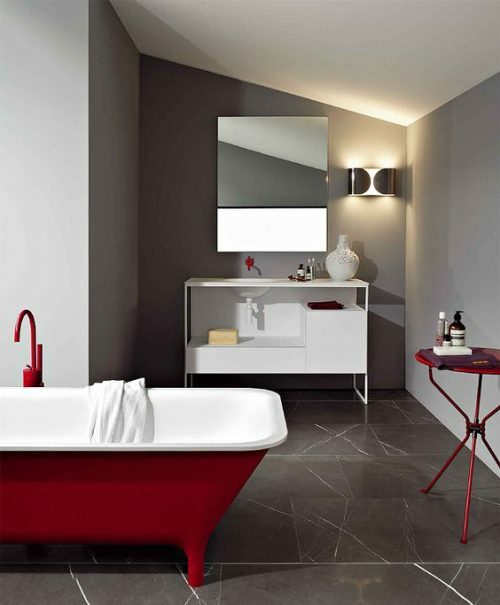 Red is glamorous and exciting and is particularly fun when added to a bathroom like this image above. It takes the grey base to another level and it is definitely not boring! I love how the bath base has been painted to match the tap and side table. 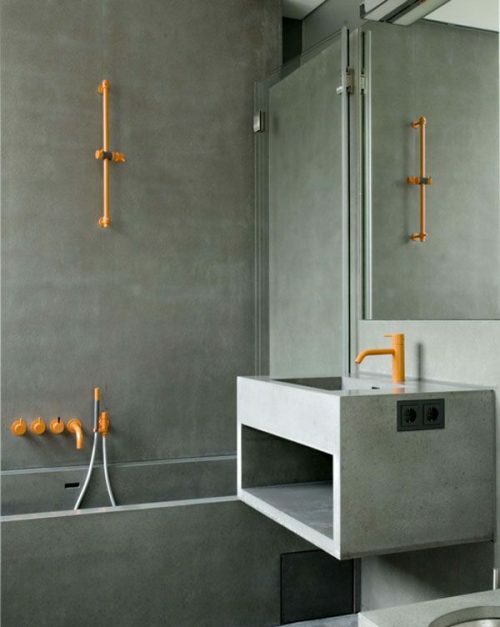 You don’t always have to use coloured tapware in a contemporary way. Colour is meant to be fun, so draw inspiration from vintage and eclectic styles, and use coloured tapware to create a specific look that reflects your personality. 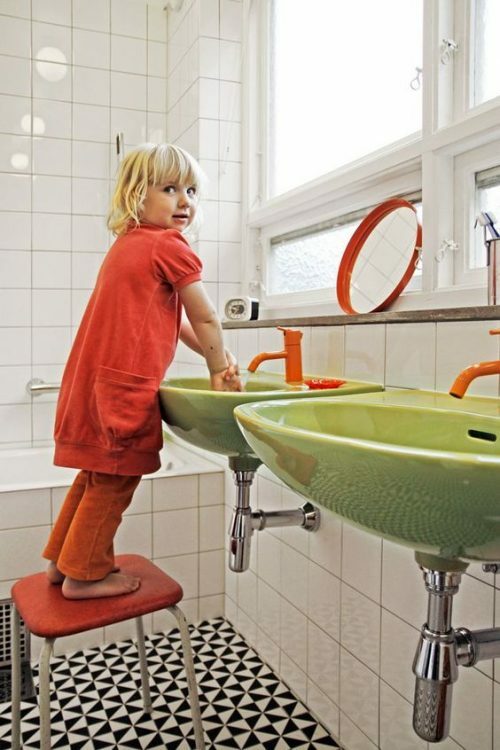 This designer has gone for a modern retro look by contrasting her green basins with bright orange taps. The look is quirky and works well with the contrast of pattern in the floor tiles. 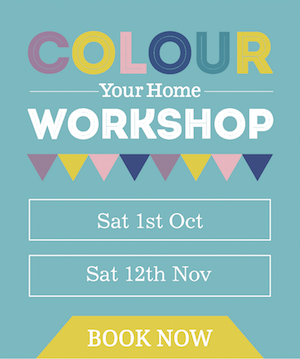 What colour taps would you choose for your bathroom or kitchen reno?